Electronic access offers features that traditional mechanical locks cannot. While these features may not be as fundamental as keeping doors secure, they can provide significant management, safety, and security advantages over locks and key alone. We explain each of these features in depth inside. One of the most powerful features of EAC is the time/date stamp associated with every event in a system. Not only do systems log when door opens, they also record whose credential was used to open them, typically down to the second, making them ideal for keeping track of employee attendance. 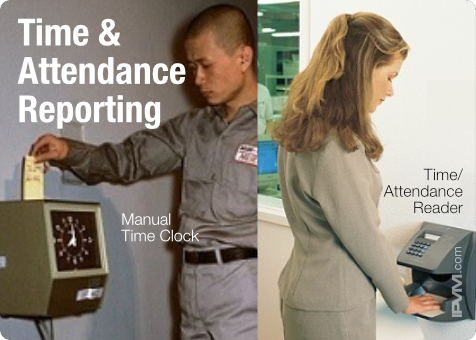 Time Logging makes it possible to 'track' a user's movement through a system, and provide a concrete record of where a person was at a given time. These logs have even been used to solve murders and otherwise establish presence at certain times with high precision. With relatively minor adjustments, most access systems can use 'time logging' with time clocks. Many workers are paid an hourly wage. Clearly establishing when they start their job and when they stop working is crucial, as 'time' is indeed 'money'. Capturing this time has traditionally been the function of precise clocks, where workers insert cards to have a the time indelibly punched out on a given day. Indeed, "punching the timeclock" is a common saying. However, the method is not problem free. First and foremost, abuse is a risk, where an employee punches more than only his/her card. This type of fraud is at the forefront of many HR and Corporate issues. Many seek to eliminate this risk/temptation entirely. While time clocks are primarily intended to protect the employer, the employee also benefits from having a clear record of attendance to lean on when calculating paid vacation days, sick days, or overtime pay. ********** ****** ****** ******** **** *********** ********** ***** ******. ***** these ******** *** *** ** ** *********** ** ******* ***** secure, **** *** ******* *********** **********, ******, *** ******** ********** over ***** *** *** *****. ** ******* **** ** ***** ******** ** ***** ******. *** ** *** **** ******** ******** ** *** ** *** time/date ***** ********** **** ***** ***** ** * ******. *** **** ** ******* *** **** **** *****, **** **** record ***** ********** *** **** ** **** ****, ********* **** to *** ******, ****** **** ***** *** ******* ***** ** employee **********. **** ******* ***** ** ******** ** '*****' * ****'* ******** through * ******, *** ******* * ******** ****** ** ***** a ****** *** ** * ***** ****. ***** **** **** even **** **** ******* ********** ********* ********* ******** ** ******* ***** **** **** *********. **** ********** ***** ***********, **** ****** ******* *** *** '**** logging' ******** ******. **** ******* *** **** ** ****** ****. ******* ************ **** they ***** ***** *** *** **** **** **** ******* ** crucial, ** '****' ** ****** '*****'. ********* **** **** *** traditionally **** *** ******** ** ******* ******, ***** ******* ****** cards ** **** * *** **** ********* ******* *** ** a ***** ***. ******, "******** *** *********" ** * ****** saying. *******, *** ****** ** *** ******* ****. ***** *** ********, abuse ** * ****, ***** ** ******** ******* **** **** only ***/*** ****. **** **** ** ******* ** *** ********* ** **** ** *** ********* ******. **** **** ** ********* **** ****/********** ********. ***** **** clocks *** ********* ******** ** ******* *** ********, *** ******** also ******** **** ****** * ***** ****** ** ********** ** lean ** **** *********** **** ******** ****, **** ****, ** overtime ***. ***** *** *** ****** *** **** & ********** ***** ***** setting ***** ******** ******* *** *** **** ******* ** ********* 'In' *** '***' ******* ** *** ******. **** * *** period ******, * ****** ** ******* ******* ******** ** ***** two *******, ******* *** '**' ******* *** *********** *** '***' intervals ******* ** ******** ****** ** **********. ** ***** ** ***** *** ******* ** '***** ********' (* risk *** ******* ******** **** '********'), **** *** ********** ******* ***** ******* ******** ************** *******, including *********** ** **** *******. **** '***** **************' ******* **** no *** *** ******** ************ ********** ** ******* ******. ***** ***** ** ******* *** ********* **** ** '**********' ********* systems **** ******* ** *** ****** *********, *** **** ********* cost **** ********** **** **** ****** ********. *** ******* ****** need ** ********* ** ******* **** ****. **** *** ********* ****** '**** *** **********' ********, **** ** frequently **** **** ********** ****** *******. **** *** ******* **** format **** ** ** *** ** ******** ******** **** ******* systems. *******, **** ** ********* * ****** *******, *** ********** or ******* ***** ******* *********** ** *** ****** ******** ** collect *******. ** ***** *****, '**** & **********' ******** *** ** ***** in *** ****** ********, *** ** ********** '******* ******' ** added ** *** ******** *** ****** ***********. **** ********** ******** becomes *** ******* ******* ********, ** ******** ** ***** ******* may **** ******** **** '***-********' ************. Clock *****: In effect, the EAC system clock serves as the payroll clock. While a variety of solutions for synchronizing/standardizing time exist, such as *** ********** ******* **** ******, *********** ******* ****** *** ***** ********** can ****** *********** ********. **** *** ** **** *** **** and **********, ******* ****** **** ** **** **** *** ***** standard **** ** *****. Single ****** ********: Or rather '******* *** **** **** ** *** ******'. ** * ****** ** **********, ** **** *** ****** drops *******, ** **** **** **** *****. *** ******* ** granting ****** ******* ******* ***** *** ***** ** ****** ** issuing ********** ****, ** ****** ******** ****** *** **** *** Attendance ********. *** ***** **** ** **** ** ***** ****** timeclock ** * ******, **** ** ****, *** *** *** time *** ****** ** *******, ******** ********* *** ********* *******. Less ** ***, ********: While a single system can be a weakness, it can also be efficient. Many facilities prioritize the upkeep of facility access systems, and issuing a credential for access also means it can be used for payroll. The investment in one facility system can be leveraged by another. ******* ******** ******* ** ***** *** ****** **** ** ****** people ** * ******** ** ******** *****. ***** * *********** of **** *** *****, ********* ****** ** ***** ** ******** where **** ***, **** ****** ** *********. *** ******* ** ********* **** ****** ******* ** ******** * roster ** ********* ** * ******* ****. ***** **** ** occupant ***** * **** ** ***** *** ***** ** ****, the ****** ****** **** *** ****, ****, *** ********** ****** of *** **********. **** **** *** ** **** ** ********* who ** ** *** **** ** *** ***** ****, ********* emergency **********. ** ****** *** ****, *** **** ** ********* ** ** account *** ******** ***********, ** ** **** *** *** ********* present ****** ** ****, **** ********** ****** *** ** ***** to *********** ***** **** ***. ** ** ********* *********, *** resources ** ****** *** *** *********** *** *******, *** ****** an ******** **** ** *** ** ******* ***** ***** ***** to ***** *******. ***** **** '********* **** *****', ********* ********* *** ** ******* in ******* ****. ** ********** ** ****** **********, ********* *** be **** *** '**** ***/ *** ***' **********, ***** ********* should *** ** ********* ** ** **** ********** ***** *** maintenance ********* *** ********* ***. ** **** *** *********** ****** has ******* ** ** ** ****, *** *** *** ******* out, *** ******** *** **-********* ***** ******** *** ** ********* for. ********, ** ********** ***** ******** ********** *** *********, **** *******, daycares, ** ********* *********, ********* *** ** ********** ** ****** that *** ******* ** * ***** *** ******* ** ** electronically ****** ******. ********* ** *** ********* ** ***********, ** *** **** ************* or ***** ******* ** ********** *********. *** **** *** '******** reports' ** **** ** ****** ******** ****** ** ********** ****, it *** **** ****** ** **** ******** ** ******* ********* alerting **** ** *********** (**: ****** ******, **** *******, ** other ********* *************). ********* ** *** * ****** ********** *********, ********** ******** ************* and ******** *** ** ********. ** '********* *******' *** ****, then *********** **** ******** *** ** ** **** **** ********* a *** **********. **** ************* ***** ******** ***** *********** ***** readers ** *** ****** ** ******* ********* *** *** ********* in *** ******, ** *** **** *****-********* ***** ** ******** schedules ** ******* ********* *** ****. *******, ***** ***** ** ********* *** ******* ********** *******. ** order ** **** ** ******** ********* ** *** ** ******* in ** ****, ********* **** '**** ***' **** **** *****. Most ****** ********** ******** ****** ******* '******** **' *** ******, so *** ******** ** ** *** ******, **** **** ******** is *** ****** ** **, **** **** *** ********** ** a ******. *** ** *** ****** ********** ** ****** ******* ** ***** used *****. ************ **** ** ******** ******** ********* ****** ** **** ******* ** ******** ******, **** the ***** ******* ** '********' ** ********. ****** **** ** ******** **** *** **** ******** **** *** years, *** *** ******* ** ***** ******* ** * ****** of ********** ********** ** * ****** ** ****. ** **** note, ** **** ** ********, *** **** *** *********, *** where **** *** ****. ****** ********** ***** *** ********** ************ ******* ****/****** ***** ** ****** ******. **** **********-***** *** ******* (including*********,*****, ******** *****, ***) ***** '*******' ************** ** **** ** their ******* **** ** ********** **** ****** ********** *** ***** to *** ******. ** ***** *****, '******** ** * ***' (** '******* ******') are *****, ********** ***** ******** *** *******, *** ********** *** doors ** *** ********. ** **** *****, ***** '****' **** with ********* ***********, *** *** ** ********** ** **** **** existing *** ******* ** *******. *** ******** ***** **** ***** ** *** ** ******** ****** largely ** ************ **** **************** *** ********. *** *******, * ***** *********** ** **** is ********** *********** **** ** ****** ******** *** ** ****** from **** ** *** '****/******' *********** ********. ******** ** *** which ***** ***** ***** ******** * ***** ************** ** *** building ****. In regards to cloning cards, is there any system out there right now that has the ability to set a time interval between reader locations that will generate an alarm if the card is read at each location within that time interval. The simple way to look at this...I should not be able to read my card at a Seattle location at 7am and also walk through a door in San Diego 15 minutes later. Perhaps before my card works on any reader in a building I need to scan it at a security check point to enable my access, where I smile and also get my picture taken. In performing the above action either someone has cloned my card or I found a teleport machine. With all the reports available on these systems does this exist? Especially after card cloning has run amuck for years now. In other words I should not be able to go thru a door in one building on the tenth floor and then read in another building on the 10th floor again in a minute time span. How can one use their EAC to analyze for cloned cards? Seems they should just build a report off of card trace...that looks at all cards in a chronological order. Any cool features such as this?